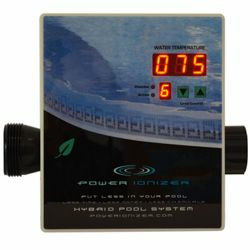 The POWER IONIZER is a trouble free swimming pool sanitizer system that releases copper and silver ions into your Pool water to kill bacteria, algae, and viruses. The Power Ionizer is very effective and safe. The Power Ionizer by Main Access allows for more time swimming with your family with less time on pool maintenance! All you have to do is oxidize (shock) your water once a week and occasionally test your pool water! That's it! We carry the Main Access Power Ionizer and we also carry Main Access power ionizer replacement chambers.